It is region of the atmosphere from 19 to 48 Kms above the earth surface. The concentration of ozone layer is 10 parts of ozone per million parts occur in the ozone layer. 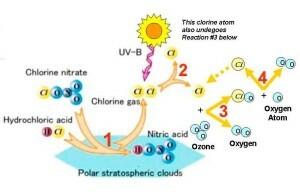 The ozone forms there by the action of sunlight on oxygen molecule. This action has been taking place from millions of years ago. However, nature also has managed the concentration of ozone upto optimum level by the presence of nitrogen, because ozone presence is beneficial in upper atmosphere only, at ground level it can damage lungs while breathing. Ozone protects life on earth by stopping UV (Ultraviolet Rays) of sun in the upper atmosphere, it does not allow them to reach at the ground level. These rays can cause skin cancer, cataract, damage to plants and crops and marine food. In 1970 scientist discovered that CFC (Cholorofloro carbon, one of the refrigerating gas used in refrigerator and ACs) and other agents like bromine, nitrous oxide from fertilizers, are attacking ozone layer. It is found that one CFC atom destroys 100,000 parts of ozone. After this alarming situation, scientists raised a campaign to ban CFC and they compelled to use other environment friendly gases instead of CFC and nitrogen. In 1980s research scientists discovered a periodic loss of ozone in Antarctic region, they discovered a hole in the ozone layer. By satellite and weather balloons data, it was discovered that O3 (ozone chemical formula) is depleting. World metrological organization has found that over 45% depletion is at northern hemisphere. What are preventive measures to save ozone layer. Accordingly in 1987 Montreal protocol for the protection of ozone was signed and later it was ratified by more than 36 nations. During December 1995 over 100 nations were agreed to phase out pesticide methyl bromide ( it was causing 15% damage overall) more over, in the same year CFC was banned and it was decided that it will be completely phase out from developing nation up to 2010. HCFC which is comparatively less damaging for ozone is still under use.